CHARLESTON, S.C. (WABC) -- Tropical Depression Bonnie reached the South Carolina coast early Sunday, bringing heavy rain and rough tides to an area packed with tourists for the Memorial Day weekend. The storm is expected to make its way up the East Coast and bring rain to the Tri-State area Monday morning for the last day of the holiday weekend. 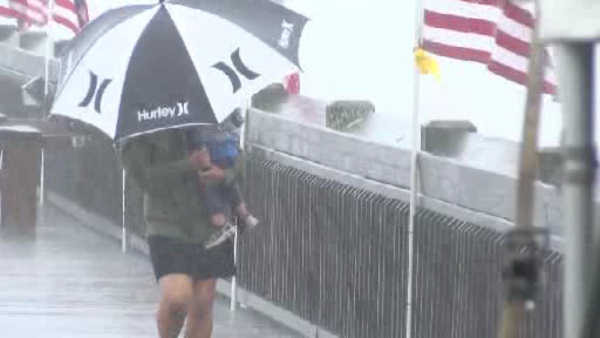 Meteorologist Amy Freeze said showers will begin Sunday night and intensify through Monday morning, bringing 1 to 2 inches of rain over a period of several hours in the New York City area, Long Island and coastal Connecticut before tapering off during the afternoon. Localized downpours could lead to flash flooding in some spots. Temperatures will fall into the low 70's.